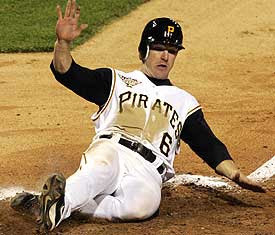 This is Part One of an Optimistic Look at the 2007 Pittsburgh Pirates. Today’s section features Chris Duffy. Keep in mind that these are not my realistic predictions for these players. This is a best-case scenario, something for the hopeful fan to dream about as we approach the upcoming season. Chris Duffy went for a wild ride in 2006. After a successful 2005 campaign which saw Duffy catch fire in Pittsburgh late in the season, he entered spring training with firm control of the center field job. But he limped out of the gate with a line of .194/.255/.276 before being demoted to AAA in May. He refused the demotion and went home to Arizona as questions arose about his commitment to the game. However, he returned in July and declared himself ready to play. Duffy quickly showed that his focus was back, hitting .349/.415/.509 in Indianapolis before returning to Pittsburgh on August 1. He started slowly but rebounded to go .315/.380/.413 with 20 stolen bases in 21 attempts in his final 45 games. Chris Duffy has had an unusual Major League career thus far, one that can be broken into three pretty distinct segments. He was red-hot during the last few months of 2005, terrible at the beginning of 2006, and very solid upon his return later in the season. The question is which player is the real Duffy? Everyone knows that he has tremendous speed and he plays defense spectacularly enough to bring up Andy Van Slyke’s name in Pittsburgh. But what will he consistently do at the plate? Remove the first month and a half of 2006, and you have a player who has been very successful at the Major League level. There was clearly something wrong in Duffy’s head during that rough stretch, but he seemed to put it behind him after spending a couple months away from the game. Now he is ready to be a force at the top of the Pirates’ lineup. In 2007, expect to see the player that we saw at the end of 2006. Be ready for the Chris Duffy that consistently gets on base, steals bases, scores runs, and is a spark for a rejuvenated Pirates’ offense.